As our lab opens a new chapter in its quest for bioactive macrocycles, I thought it would be fitting to dedicate the first post of 2014 to the concept of ligand efficiency. We all know that there is a “size continuum” when it comes to biologically active molecules. Everything under the sun has been engaged in drug discovery efforts – from small molecules that “poke” targets using a handful of contacts to antibodies that employ multivalent interactions. It is also known that, during the process of optimizing a clinical candidate, a compound typically increases in molecular weight. This makes sense because legions of medicinal chemists throw everything they have learned in grad school in efforts to improve the compound potency. Not surprisingly, potency within a chemical series is often strongly correlated with molecular weight. This was noted by luminaries such as Chris Lipinski at Pfizer as well as by researchers at other pharmaceutical companies. Here is an interesting fact, though: despite the rise in the molecular weight of clinical candidates, the mean molecular weight of drugs in clinical development declines in each subsequent stage to market (http://pubs.acs.org/doi/abs/10.1021/jm021053p). Isn’t that interesting? It is at this stage that we need to consider the concept of ligand efficiency. The latter is quite intuitive: it represents the binding free energy for a ligand divided by its molecular size. In this regard, the following paper by Reynolds and co-workers is significant: http://www.sciencedirect.com/science/article/pii/S0960894X07005914. Upon examination of thousands of examples, the authors came to the conclusion that ligand efficiency increases rapidly up to 20 heavy atoms, but reaches plateau beyond 25 heavy atoms. This “magical number” 25 roughly corresponds to the size of a tripeptide sequence. In fact, there is an awesome paper in J. Med. Chem. that discusses “privileged” sequences of amino acids. This manuscript stresses the significance of tripeptide motifs due to the maximal ligand efficiency achieved at around 25 heavy atoms (http://pubs.acs.org/doi/abs/10.1021/jm1012984). RGD (Arginine-Glycine-Aspartic acid) is the proverbial example of a privileged tripeptide motif. 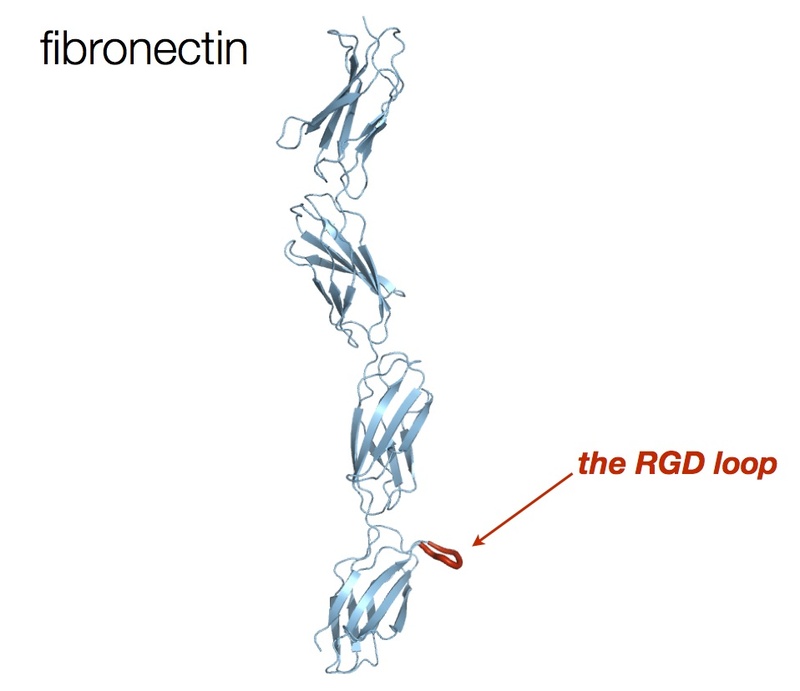 Discovered by Erkki Rouslahti (now at UCSB) using phage display, RGD is a protrusion on the surface of fibronectin (shown below). This area of fibronectin mediates its interactions with integrin receptors. As you might know, the RGD sequence has found numerous applications in the area of cyclic peptides. Nature is really telling us something with this loop and suggests cyclization as a means of designing peptidomimetics. But let’s think about it: how many other, undiscovered, RGD-like sequences are lurking out there? I will bet that there are many… We need to find them. There is also opposite opinion on the whole LE business. I like articles by Shultz (the most remarkable example is http://pubs.acs.org/doi/abs/10.1021/ml4004638). If you read carefully the article from Wenlock et al., their claim that there is a trend in average MW is not supported by their own figure 3. You can notice huge overlapping 95% confidence intervals. They do a classic trick to make the “trend” more obvious – that is their y-axis does not start from 0. Another thing is that mean MW should be sensitive to outliers (e.g. drugs with very low MW) and sample size (which is much bigger in the case of failed drug candidates). I wonder if median MW preserves the same trend over drug development phases. Very nice blog, by the way! Thanks a lot for a very valuable comment. I agree wholeheartedly with the danger of data manipulation! I will look up the Shultz article you suggested, for sure. But still, I am spellbound by the effectiveness of things like RGD. There are certainly privileged motifs out there that draw on effective conformational presentation of fairly small groups of atoms in dense areas of space. Someone needs to properly quantify this.